I will admit it once again...I DO NOT sew garments...I do not speak the language...I am from the land of paper piecing and half square triangles...of bindings and backings all all the good things that come with quilting ( although I do not consider myself a real quilter). I did see a pattern for a wrap dress, I LOVE wrap dresses!!!! Flattering on every figure, comfortable and can go to any event. It may be the one HAVE to HAVE that will always be in my closet. At the top it says..."VERY EASY VOGUE"...I was questioning that on my Facebook Wall and two of my sweet friends Teresa from Crinkle Dreams and Jen at BettyCrockerAss pitched up and said "Let's DO THIS!" Having people on your team when undertaking an unfamiliar project is a good thing! I chose to work with a heavy knit with a gathered pattern, it is pretty cool but weighs about one ton, Teresa says it can be my cardio when I wear it,LOL!!!! When I finally figured out what the H*** the pattern was saying, I was able to sew together the bodice, lining and all!!!! For the lining I bought some Pellon Ek 130 Easy Knit...in BLACK!!!!! As with all the Pellon products I have used...LOVE!!!!! So, here I am, four days later, with the bodice done and 50 more pounds of skirt to attach...it is bigger than me so I am a bit afraid of it!!!!! If you do not hear from me by next Monday, could you please send out a rescue team to look under a HUGE pile o black knit!!!!!!! What a great pattern!!! It does look like a go to dress. I'm sure you can handle that shirt now!! That will be the easy part. It looks great! And I am totally with you, I don't speak garment at all. Good luck, I'm sure the skirt will turn out great! Great job!!! The bodice is definitely the hardest part, so the skirt should be fairly easy! Just remember the internet is your friend, if you don't understand a term or technique do a search, most likely someone out there has done a tutorial on it. I've been sewing (mostly garments) for over 30 years both for myself and others and I had pretty much sworn off any pattern from Vogue. 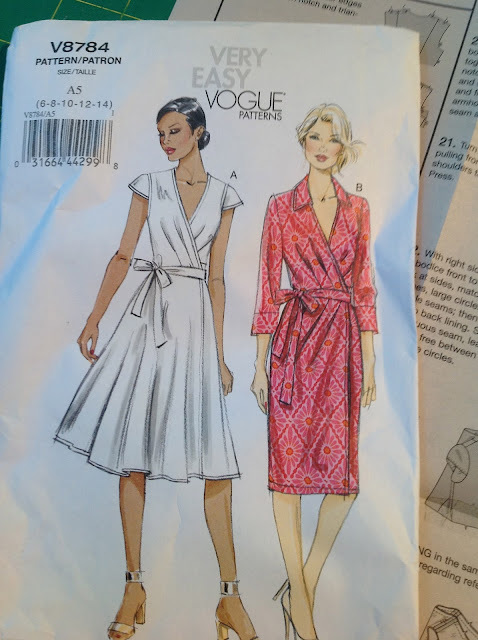 Even for an accomplished seamstress Vogue's directions can be hard to understand and sometimes they simply make things harder than they have to be. On many an occasion I've sat and stared at the Vogue directions saying, "WHAT!?! ", okay maybe I was actually screaming at the directions! Hopefully they wrote easier directions for the "Very Easy" Pattern! It'll be beautiful when you finish!!! You did a great job and the skirt should be easy. One hint, have someone mark the hem for you with it on so it will be straight. Knits cut this way will stretch in some parts and not others due to the grain lines on the pattern and the fabric. It will be fantastic when finished! Your dress is going to be fabulous! Another little hint, from someone who has sewn her own clothing for years...leave the garment to hang for a few days before you take up the hem. It helps things settle into shape! patternreview dot com is a great site to see what others have said about the same pattern then you can add your own reviews. you should add some seam tape to the skirt-bodice join to help keep it from stretching out of shape. The bodice looks great, and I would say that is probably the "hard part" done. Skirts might be longer seams, but the are pretty basic construction. I bet you'll love this dress when finished! That's a beautiful bodice, and it looks like you not only survived, but mastered the garment-sewing thing. My St. Bernards are on notice, kegs full, in case you need rescuing from The Skirt. hey well done! It looks gorgeous. Oh Kim, it's lovely. I can't wait to see it allll finished. I think, after wearing mine twice now, I will go with a stretch fabric next time. I don't like knits, but would probably grab something with a little give in it for the back/shoulder ease. Investment Grade Gold Coins and Bullion? Blanchard and Company. Gold, Diversify your portfolio with investment grade gold coins. Why are U.S. Investment Grade Gold coins such a great investment? Investment Grade performance vs. price. In case of ETFs, you can buy and sell the shares anytime you want. Without a doubt, an investor should focus on the costs of the brokers and any features that they may offer. Buy Gold and Silver Bullion Online with GoldMoney. Optimise Your Investments. Physical gold, silver, platinum and palladium are tangible assets. While gold and silver are foremost monetary metals that shine in times.